A while ago we checked out The Boy Who Loved Math from the library. It quickly became one of our favorite math picture books. I loved all the math incorporated into each picture. My son studied it over and over and read all the fine print in the back and said he wants one for his own. 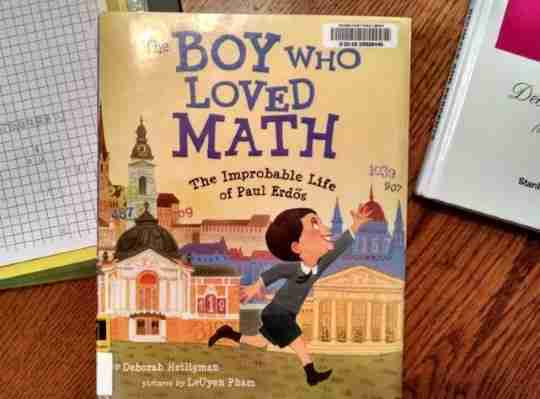 This led me on a search to find other great math picture book biographies. Here are some of our favorites. Sophie’s parents and everyone around her didn’t think that a girl could or should study math. Her parents even took away her candles and her warm dresses so she couldn’t study. But nothing stopped Sophie from learning. Eventually, when she was the only one who could find a mathematical formula that would predict vibration patterns, the world had to recognize her mathematical achievements. Sophia’s parents take away her candles so she can’t study math. More than a century before the invention of the first modern computer, Ada Lovelace wrote the first computer program. Leonardo Fibonacci is best known for the number pattern that appeared in his famous rabbit puzzle. These numbers make up the Fibonacci Sequence and are the building blocks of nature. This book is a fictionalized account of Pythagoras’ childhood. Young Pythagoras keeps running into problems. How long should his builder friends make their ladder? How can they make square corners on the bases of their columns? Can he help his father find out the distant to Crete? He discovers the Pythagorean Theorem to help them out. Eratosthenes was a question asker. One of his most burning questions was, “How big is the earth?” Using his knowledge of science and math, he “measured the earth” with surprising accuracy. Math and astronomy go hand in hand. Caroline Herschel used her love of math and astronomy to be the first woman to discover a comet. When Katherine Johnson was little, she loved to count. She counted everything around her. More than anything, she wanted to learn all she could about numbers and the universe. When she faced difficulties getting into high school because she was black, she knew she could count on her dad to help her out. Later when Apollo 13 was in trouble, the three astronauts on board counted on Katherine to bring them home safely. Grace Hopper transformed the world of computer science by her innovative way of thinking. Graphs are all around us and we take it for granted that this was not always the case. When William Playfair invented graphs, he thought he had hit upon a brilliant invention, but people thought they were of little use. Like so often happens with those who have brilliant minds, Isaac was misunderstood as a young child because of his unusual way of thinking. His teachers called him “cunning” and “crafty” but never clever. However, he became one of the most influential scientists of all time. Margaret’s interest in numbers and the universe caused her to become a pioneer in computer programming. Not much was known about computer programming at her time, but that didn’t stop Margaret from figuring out her own programming and, as a result, becoming a hero in the Apollo 11 mission. Hypatia was an Egyptian woman who lived in fifth century Alexandria. At that time, women were not expected to learn how to read and write. Due to her curiosity and a father who thought she should be educated the same as if she were his son, she became a respected philosopher and scientist. Do you have any favorite math picture book biographies?